In newly released court documents, we learn that Dear told police that he admired Paul Hill, an anti-abortion minister who was executed in 2003 for the 1994 murder of Florida abortion doctor Dr. John Bayard Britton and his bodyguard. Dear’s girlfriend also told police that he spoke admiringly to her about Hill on two occasions when they drove past Planned Parenthood clinics. The documents, which were unsealed after a petition by the Associated Press, include Dear’s arrest warrant, as well as multiple search warrants for his email, computer, and residence. They paint a portrait of a man that, despite what some have argued, was obsessed with closing abortion clinics by any means. 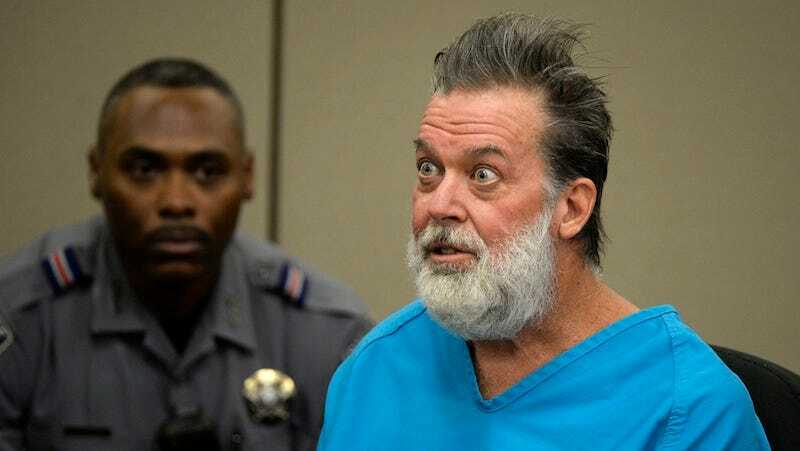 Dear told police that prior to the November 27 shootings, he had previously tried to superglue the locks at a South Carolina abortion clinic, a technique that the AP notes is “common...among activists trying to shut down facilities.” In Colorado, Dear became increasingly focused on chis mission of closing a clinic, and constructed a makeshift metal vest, made with duct tape and coins. According to the Washington Post, he armed himself with four SKS rifles (semi-automatic rifles popular for hunting) and two propane tanks before driving to the Colorado Springs Planned Parenthood. He planned to shoot at the propane tanks, causing an explosion. Though his broader plan failed, Dear still killed three, Ke’Arre Stewart, 29, an Iraq War veteran; Jennifer Tarkovsky, 35, a mother there to support a friend; and Garret Swasey, a police officer who had responded to the call. The standoff lasted for five hours before police captured Dear. Almost immediately after his arrest, Dear said “no more baby parts,” to the police, a likely reference to “sting” videos released by the Center for Medical Progress. Like his hero Paul Hill, Dear shows no remorse, arguing that his actions were justified, a protection of innocent life. At his December hearing, Dear called himself a “warrior for babies,” and compared himself to Hill whose website he visited often, posting messages to the forums that it still hosts. Dear told police that he would ultimately be rewarded for his actions, he dreamt that he would be “met by all the aborted fetuses at the gates of heaven and they would thank him … for what he did because his actions saved lives of other unborn fetuses.” It’s uncanny how much protection resembles terrorism.